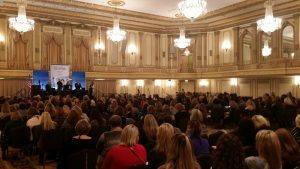 During the first week of November I was able to go on a trip to Chicago and attend a Women’s Council of Realtors convention and National Association of Realtors Expo. I am so grateful to have had this opportunity. The Women’s Council is a volunteer organization, but as a leader in that group they pay for me to go to these types of trainings. I am a firm believer in when you give you will get. The more time and effort I can put into volunteering for these types of organizations the more knowledgeable I will become about an industry. Since I am a Realtor, the Women’s Council of Realtors is a great pipeline to gather information on sharping my skills in the trade, as well as meet and connect with people that can help me further my career as a Realtor. I left via airplane on Wednesday from Idaho Falls to catch a connection flight from Salt Lake City to Chicago. The first flight from Idaho Falls to Salt Lake is only about a 35-minute flight. I sat next to a woman who was leaving to go back to Seattle. We had a great conversation about family, friends, hobbies, and pets. She told me she loved the Idaho Falls area and would eventually like to live there one day. I gave her one of my cards and told her that if she was ever back and wanted to look at houses I was her man. The morel of this is that while volunteering I was able to start a cold lead, that may or may not turn into a sale later. Once in Salt Lake I had to really run to the connection flight so I was the very last person to get on the plane. Turns out that the airline had overbooked the flight and they gave my seat away. They did however make it right and gave me a seat in business class next to another woman who I got to know well over the course of the 3-hour flight. Long story short I ended up giving he a card as well and made a second cold lead contact that will go into my sphere of contacts and may or may not turn into something later. Once in Chicago I was able to enjoy my first Uber ride. Uber is like a taxi that you can contact via an app on your cell phone. The young man that was my driver was really into cars and loved to drive fast. He asked me if I would like the slow and safe ride or the fast and efficient ride. I chose fast and efficient only because I wanted to get to the hotel and get settled. WOW. That guy likes to drive fast. He and I had a great conversation about cars and Chicago. He told me that there are parts of Chicago that are for sale for very little. This may or may not turn into an investment opportunity for me at a later time. I made it to my hotel safely went to bed. The next day the convention was starting and I was very happy to be able to have made some connections with people and this week had not even started yet. The convention was fantastic. I went through several trainings over the next several days. learning about body language, drones, videos, marketing, networking and many other topics. All for free because I was giving my time to help the Women’s Council of Realtors in Idaho Falls. The best part about the entire trip was being able to connect with a Realtor from Boise. 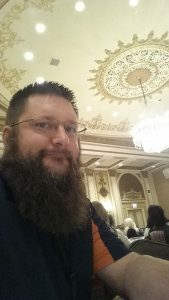 He has been in the industry for over 15 years. I was able to spend quite a bit of time with him during the convention and expo. As we spent time together he kept asking me questions about my business that frankly I did not know the answers to. Over the course of those few days I learned that I have a lot of work to do when I get home. Not even for someone else but for myself. I spend so much time trying to reach out to people in order to generate leads, that I have begun to miss taking care of my business. He encouraged me to start reading books that could help me open my mind and gather even more information and knowledge. I was able to read the book Rich Dad Poor Dad on the flight home which lit a fire in my belly. In that book it talks about “minding your own business.” I love this because it has several meanings. One I do not need to be worried about what everyone else is doing around me. Two I need to really be watching my business. Looking at the numbers all the time. Back to Chicago, this other Realtor from Boise was really coaching me up and causing me to think about all points of the business of being a Realtor. He also reminded me that I needed to not get so focused on the numbers that I lose the lead generation. Which is exactly what I tend to do, go off on a rabbit trail and focus too much on one thing. He taught me that I need to focus on the business as a whole. I need to time block and manage every portion of the business. Now that I am home and can get back to work I am going to set in place some systems. Things that help me every day to do a little. Time block off things like writing this blog. Set a time to do the lead generation. Set a time to learn about business and Real Estate. Today is a new day, tomorrow will be another brand-new day. If I were to fail today there is tomorrow. However, if I do not capitalize on the things of today then today is forever lost to yesterday. I hope this can be of a help to anyone out there that is thinking about getting involved in something that is bigger than themselves. Volunteer for something and try to gain as much knowledge as you can, knowledge is power. You are the only one that can do it, you are the only one who can gain it. Your brain is the single most powerful computer you will ever own. Use it.